Please click on the image above to see a large size image of the article. Pic(k) of the week 17: Who is looking at who? When I looked up while photographing them, I was surprised how close I was to one of the four-footers... Without me noticing, he had gradually moved closer and was now about 10 cm away from the front element of my lens. Just about to lick it! Staring straight at the animal, it made me think, " Who is looking at who" here? The image was shot in harsh light (around 2pm or so), which made it a perfect image for a Black and White conversion. More camel and desert shots here. 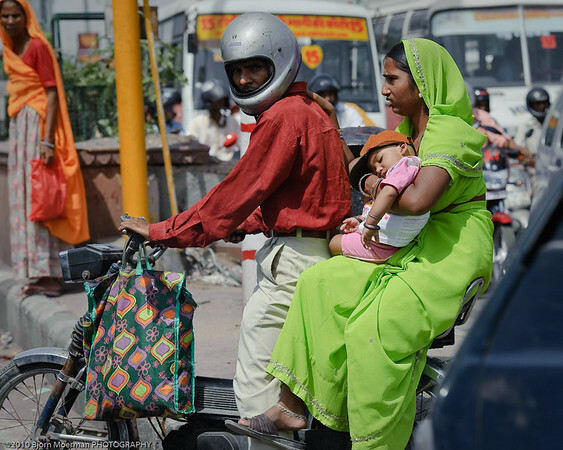 For some people it can be shocking how kids sit unprotected on motorcycles and in auto rickshaws. Who am I to judge and say what is right and what is wrong? During a brief fuel stop I shot this image of a tractor trailer that flipped over on the side of the road. A few guys were manually unloading it before getting it back on its wheels. The job was surely long from finished, but what I always find amazing, is that these people never loose their smiles! Without doubt a great lesson for a lot of us.. 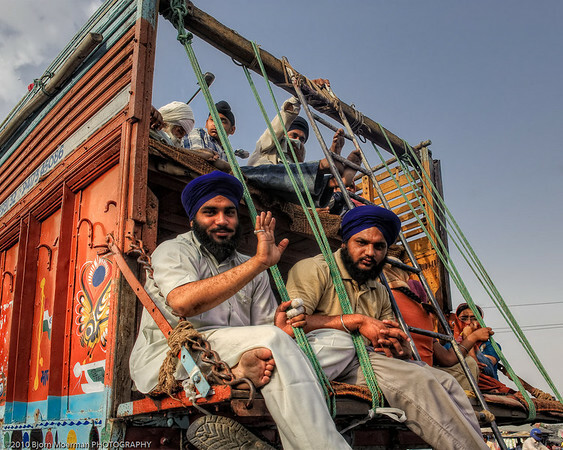 There is quite a lot of truck traffic between Delhi and the capital of Rajasthan. Most if not all of them, are nicely decorated. I especially like the painting on the backside. While doing the research before the trip, I bumped into Photographer Sephi Bergerson of Foto Wala. 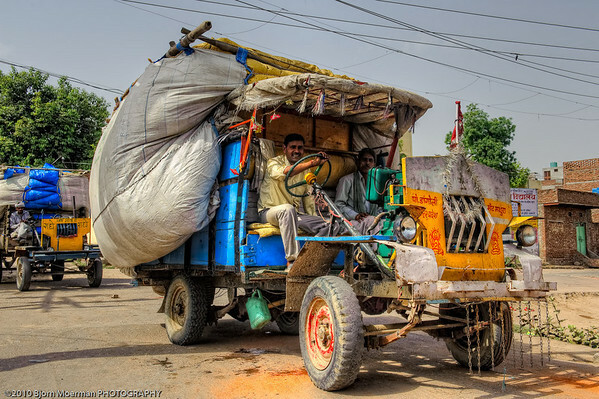 He lives in India and has an interesting collection called, "Trucking in India". Coming home to Dubai, I felt that the Indian trip was an eye opener for general life here in the Gulf. I personally think all expat and local teenagers in the region should be send on a compulsory trip to the subcontinent in order to see how life can be very different. Lastly, I'm working on a 10 min photo slideshow of the trip, which should become available through Youtube soon. Today I'm taking you on a sightseeing tour of Jaipur, the Pink city and the capital of Rajasthan. 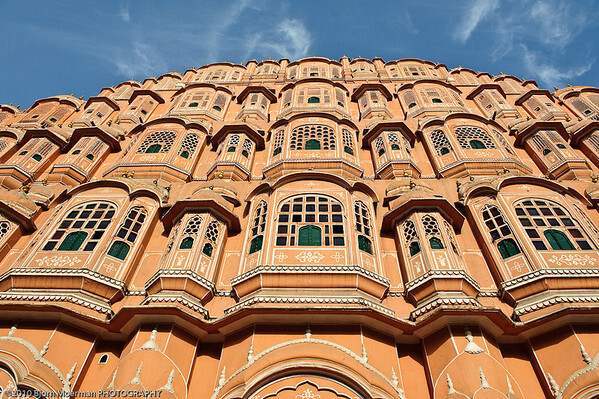 We left the hotel after breakfast and made an initial stop at the Palace of the Winds, also known as Hawa Mahal. 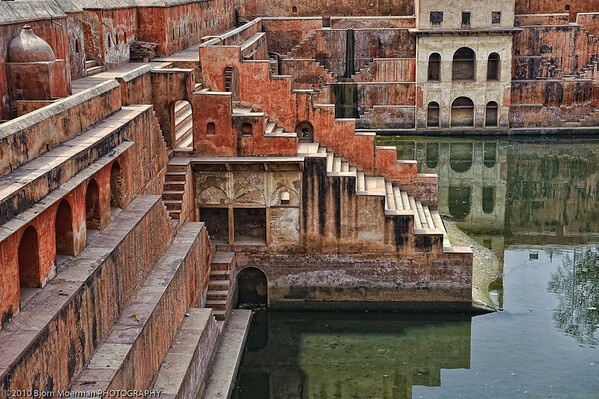 The Palace was built to let the Royal ladies observe the daily street life and is made of pink and red sandstone. It was completed in 1799 and is best photographed early mornings, when the sun really brings the building to life! Our next stop and main visit for the morning was the Amber Fort, located in Amber, 11km from Jaipur. It blends Hindu and Muslim (Mughal) elements in perfect harmony. Tourists can ride up to the fort from the base of the hill on elephants. 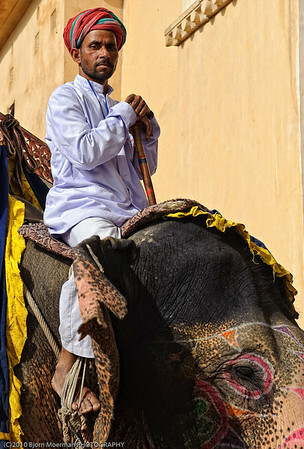 The elephant drivers sitting on the decorated animals, are an interesting photo opportunity. More of the images shot during our 2 hour stay can be found here. 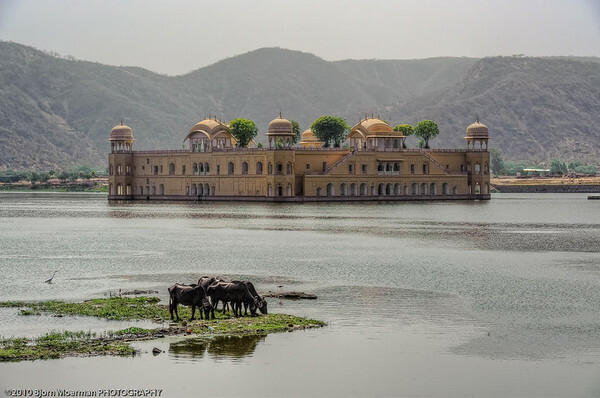 Driving back towards Jaipur we stopped at famous Jal Mahal. During most of the year, the Water Palace can only be reached by boat. In the late afternoon we visited the Jantar Mantar. The astronomical observatory built in the early 18th century, consisting of 14 major geometric devices to measure time, predicting eclipses, tracking stars and much more. It is the last one and the best preserved of the five built in India. An absolute must if you're in Jaipur. The shadow of the largest sundial (27m or 90ft tall) moves visibly at 1mm per second, making it very accurate for its day and age. 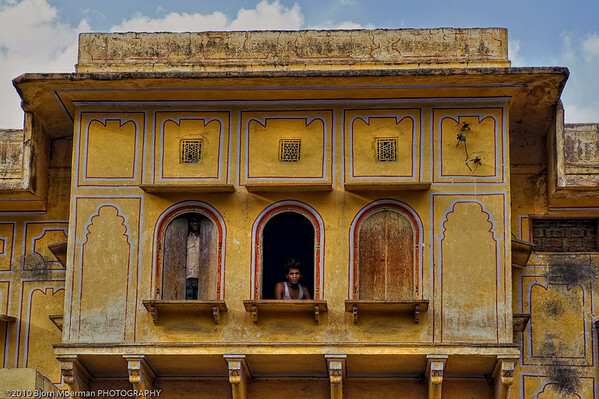 We spend the time around sunset in the old center of Jaipur observing daily life. One is never bored in a place like this... a photography paradise! 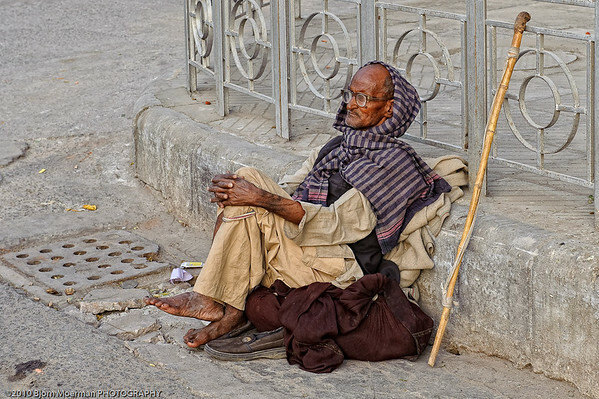 As an image maker, I can stay hours on a street corner in cities like Jaipur and just observe people. The next day (day 6) was unfortunately our last day. We headed back to Delhi by car to catch our flight to Dubai. 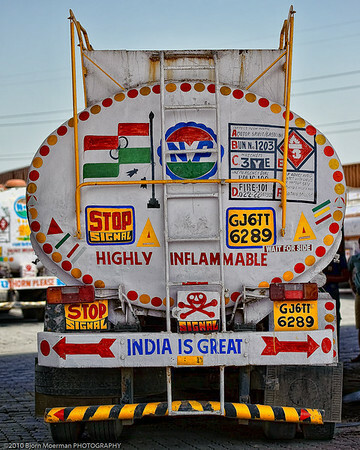 I'll finish this series with one more post on transport in India and some final thoughts. Pic(k) of the week 16: Ninja at work! Earlier this week I went out again to the Jazirat Al Hamra village near Ras al Khaimah. I've blogged about the abandoned village earlier. This time a flying buddy and fellow photographer, JC Baus joined me on the afternoon trip. Please take a minute and checkout his work at photobaus. 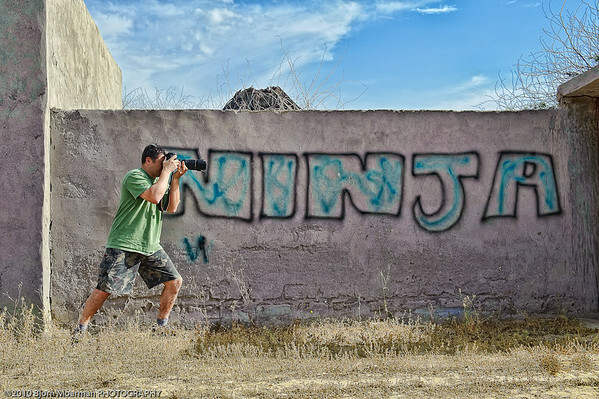 This is the Ninja in action above... We mainly went out to shoot some HDR images. Some of the images can be found here. Sorry for the delay, but my last Incredible India blogpost will be online the latest by next Saturday. After visiting the Taj Mahal on the early hours of day 4 on our Incredible India adventure, we continued Westbound towards Jaipur, Rajasthan. 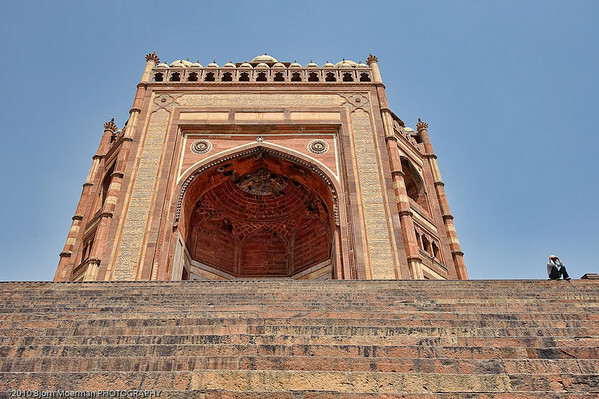 Forty kilometers out of Agra we stopped at the historical city of Fatehpur Sikri built by emperor Akbar in the 16th century. The city was abandoned after only 14 years due to a lack of water for its growing population. Today it is very popular with people traveling between Agra and Jaipur. These 2 young boys were taking a break from playing around the graves, when I was able to make a quick photograph of them. Four hours later we approached Jaipur, also known as the Pink city. 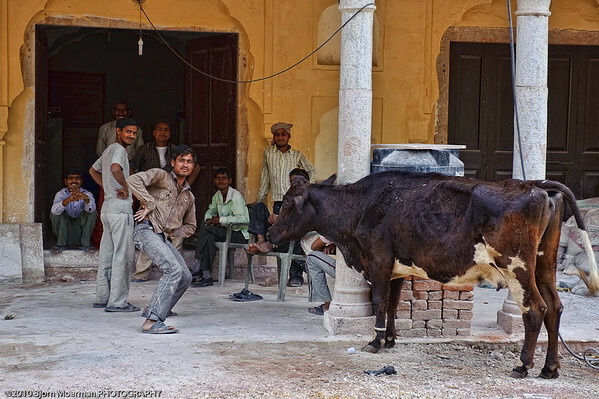 While doing my photo scouting work, I had read about an interesting place just before Jaipur, called Galta. It is the home of the Galtaji Hindu Temple consisting of 7 pools built on a hill in a lush green landscape of nature. 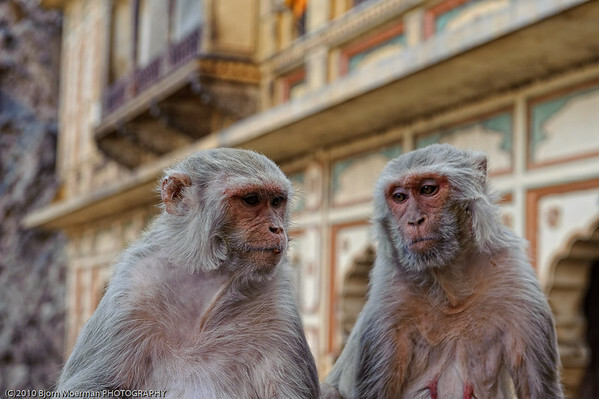 Beside the hundreds of monkeys living in and around the Temple, it is also a well known Hindu pilgrimage place. A jewel hidden in the mountains! There are very few non-Indian people stopping in Galta and it surely shows the benefit of doing your homework on trips like this! While leaving the place of worship, I shot this image through the back car window of two young ladies collecting drinking water for the night. It was after sunset when we checked into the Ramada hotel Jaipur. More on the Pink city in a few days. Pic(k) of the week 15: I found the Orange one! 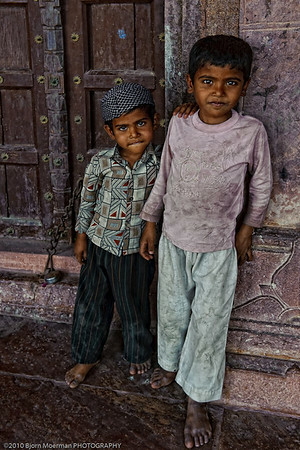 While editing my +1500 Incredible India images I passed by this one. 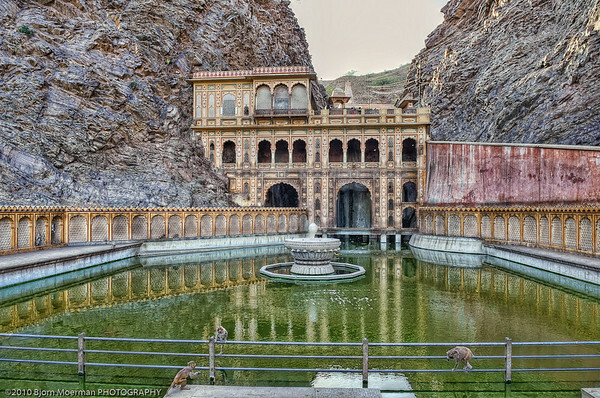 It is shot in Jaipur, Rajasthan, India. 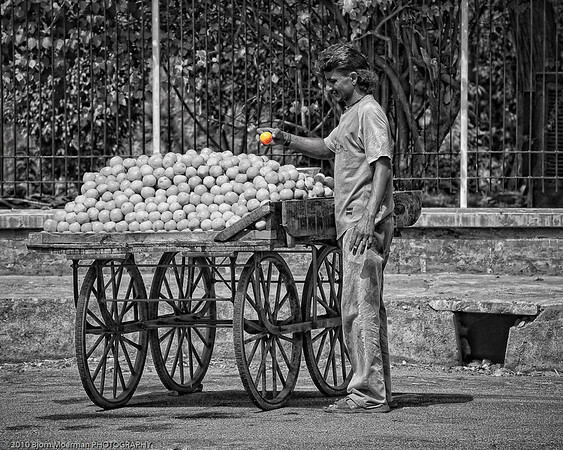 Im' not a big fan of selective color images but I do think it is an ideal candidate! "I found the Orange one!" Simple Grayscale conversion in Lightroom and then erased the edit layer with the Brush tool. Done in less than 30sec. 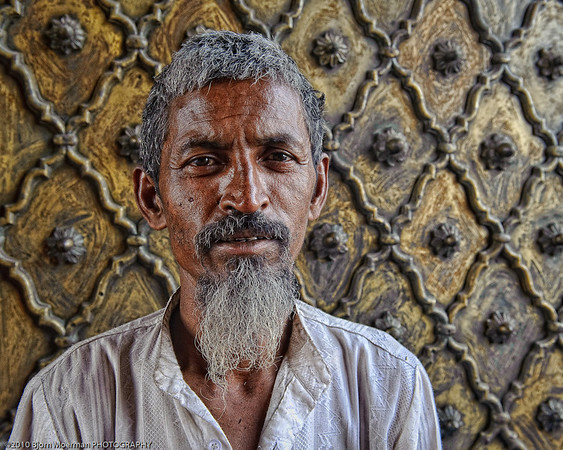 The next Incredible India blogpost should be online tomorrow. 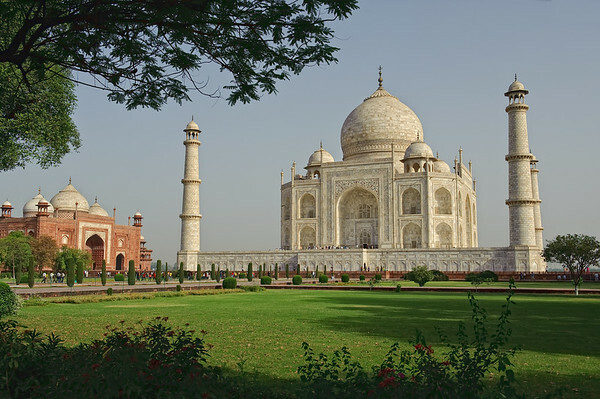 Today we visit the most iconic monument of India, the Taj Mahal. 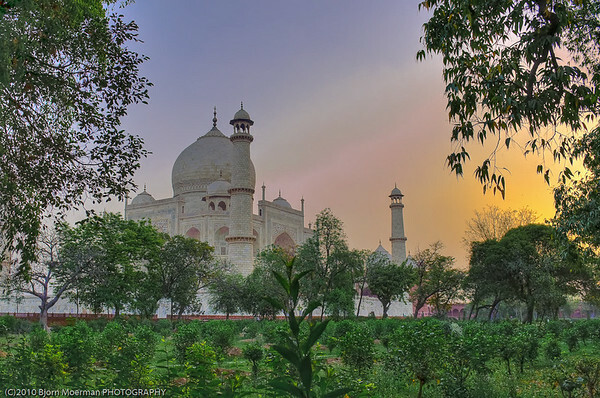 Reading other photography blogs, it was quite obvious that one needs to see the Taj at sunrise. While the gates open at 06h00 we were at the ticket office a quarter to. My iPhone gave me a local sunrise of 06h12. As a travel photographer I'm a huge fan of the iPhone app MagicHour (the old Vela clock). It gives you exact sunrise ( and moon) with the azimuth for any position on earth. Even though there are quite a bit of negative write-ups on the net the Taj did definitively not disappoint us! Our first view of the monumental tomb was through the main gate. I do realize this shot has been made a million time, but I still feel I had to include it. I then quickly moved on to the North Western side, to shoot the sunrise while there was nobody around. Next was the East side. The sun was now just peeking above the horizon and shed beautiful light on the marble mausoleum completed in 1653. Interestingly enough the 4, 40m tall, minarets are tilted slightly outwards in order not to damage the main building if they would collapse. 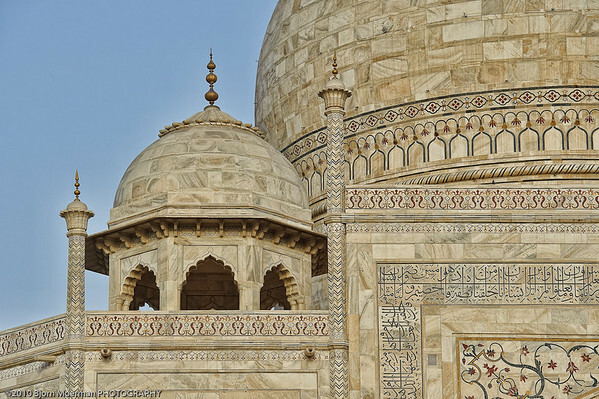 A closer looks reveals the wonderful detail of the building and the inlay stone decorations which are among the finest in Mughal architecture. Photography inside the building is not allowed. 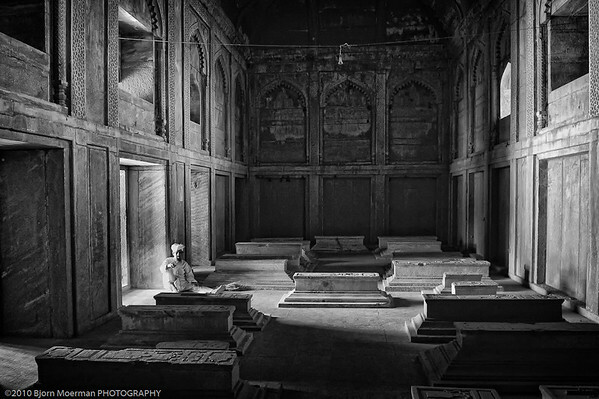 My Nikon D700 must have self-fired while pointing at the grave of Mumtaz Mahal and her husband Shah Jahan, who build the Taj Mahal when she died while given birth to their 14th child. Her grave sits exactly in the center of the monument. On exiting the main building these 4 ladies seemed to be having a great time... Who can pass such a wonderful play of colors without making a photograph? 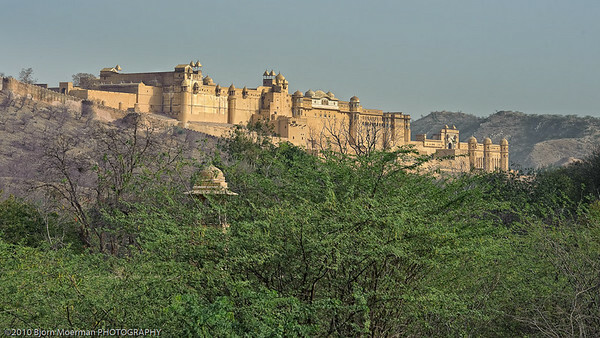 After spending about 3 hours on the site and agreeing this a must see, we went back to the hotel to grab breakfast and then continued our journey Westbound to Jaipur, Rajasthan. All of the Taj Mahal images here. 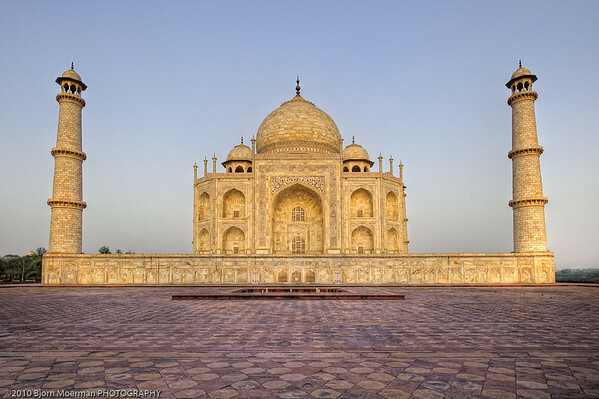 Previous "Incredible India blogposts" can be found by scrolling down. 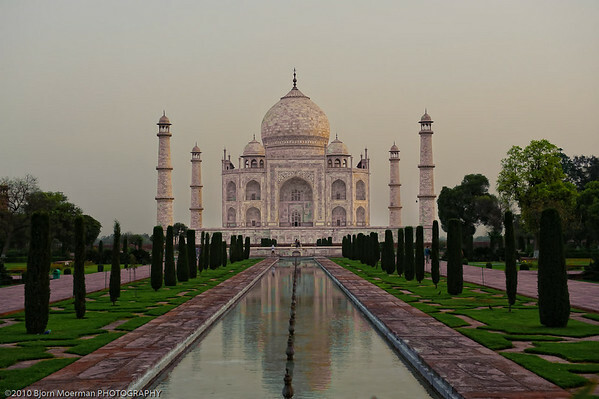 It was early morning on day 3 when we left the Le Roi hotel for Agra, the city of the world famous Taj Mahal in the Uttar Pradesh state. The just over 200km drive was planned to take about 6 hours, with a few short stops on the way. I had heard interesting things about the city of Mathura, about 60 km North of Agra and asked the driver to make a quick stop. It is the birthplace of Lord Krishna and the story says that the image above whas the place where the cloths of Lord Krishna were washed. Whatever it really is, it was surely an interesting architectural viewpoint. 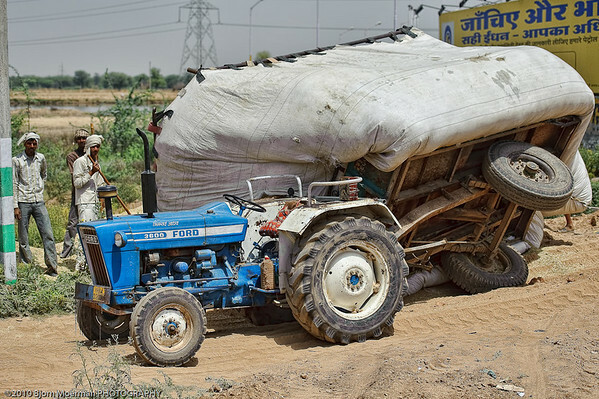 While waiting for the train from Delhi to Agra to pass, I photographed these two self made trucks called Juhar's (translated to improvisation) and used by farmers. And yes, they might be a bit basic, but they do work! Over having a short siesta in our Agra hotel, we went out just before sunset, to the Agra Fort for a shoot during the Golden hour. 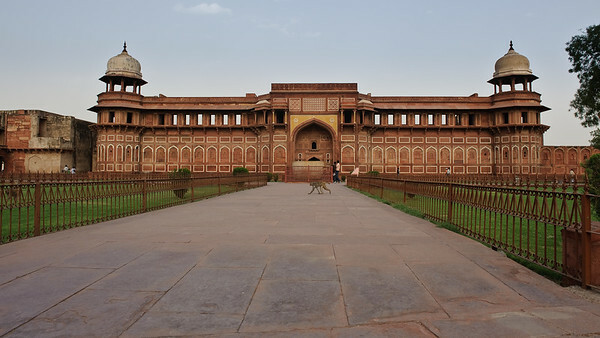 The fort which is one of India's Unesco World Heritage sites, dates from the 16th century when Agra was the capital of India. 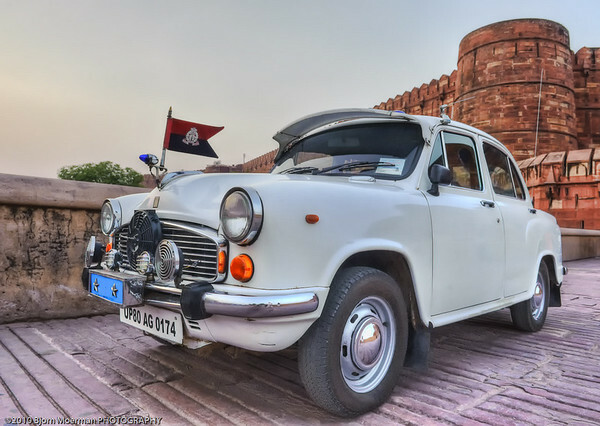 A photography trip to India is not complete before making a few images of the famous Hindustan Ambassador cars. Despite its British origin the Ambassador is definitively considered an Indian car and is proudly called the Kind of the Indian roads. 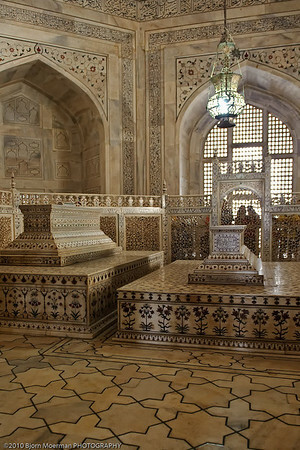 On the next blogpost, you will join us on our visit to the finest piece of Mughal Architecture. To view more images of day 3, click on any of the images above or click here. On day 2 of our incredible India tour, we did some sightseeing around Old and New Delhi. We initially headed South and stopped at the Baha'i House of worship. 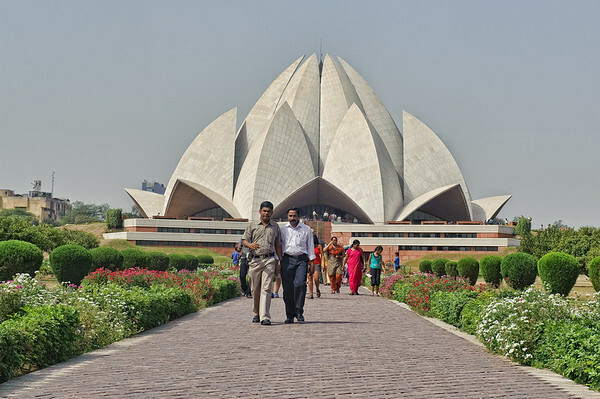 The building, also known as the Lotus temple was designed by Iranian architect Fariborz Sahba and was completed in 1986. 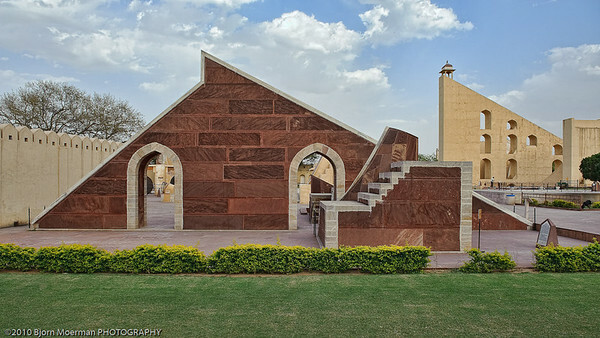 It has won multiple architectural awards and is worth a visit if you're in the Delhi. 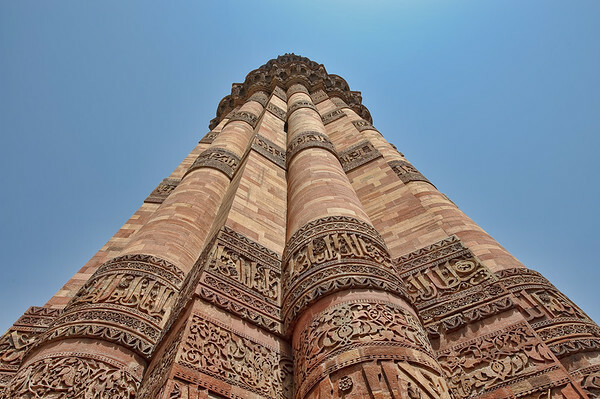 From new to old we stopped at the Qutb Minar. The tallest (73m) brick minaret in the world. 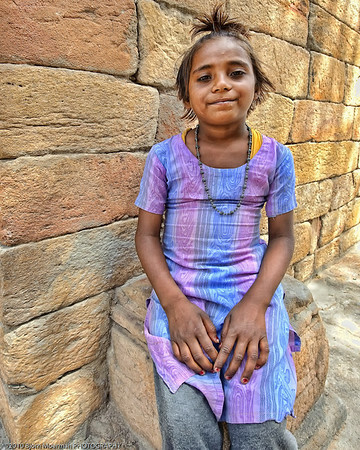 We spend quite some time at the monument built in 1386 and photographed three colorful young Indian girls. The youngest one was initially a bit shy but eventually wanted to have her photo made too... We bought them a drink on exiting which they gladly accepted. One of my favorite images of day 2 is the image above. I like the way the image tells the story. 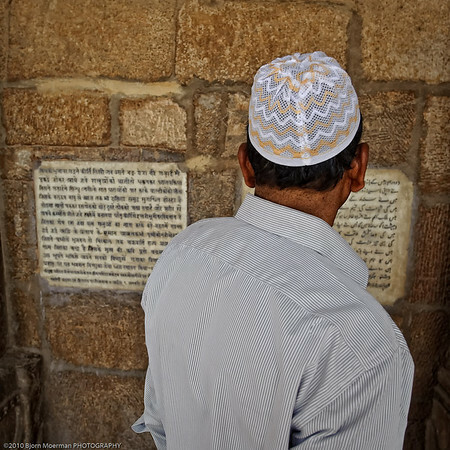 Muslim man in India (if I'm not wrong, Hindi text on the left, ...) reading the Arabic text. 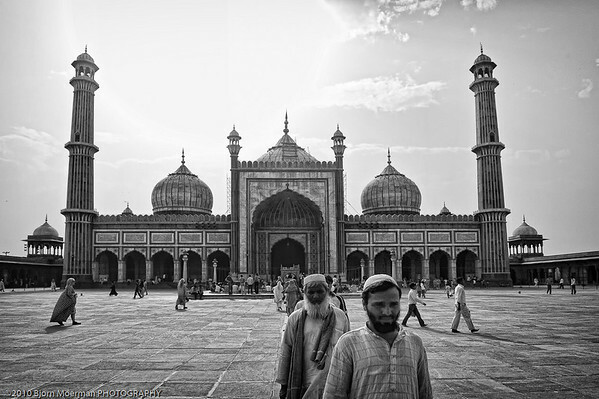 Next was the Jama Masjid, the largest and most known mosque in India which was completed in 1656. Temperatures approaching 40C, made the mosque a popular place to cool down. The guardian of our shoes gladly accepted to make his photograph in front of the main entrance door. Before heading back to the hotel, we visited Raj Ghat, the place where Mahatma Ghandi was cremated in 1948, the Red Fort and the India Gate. Images of these places can be found here. 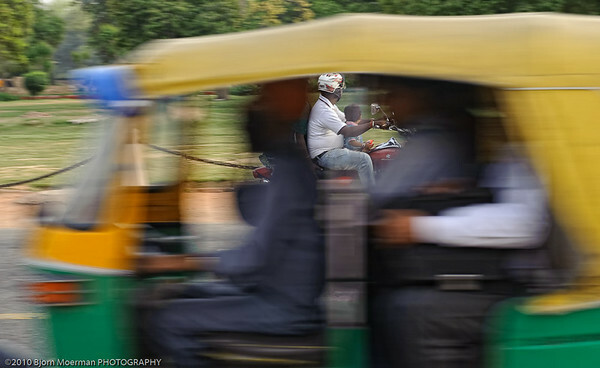 Pic(k) of the week 14: India at full speed! Notice the small kid on the motorbike sitting in front of his dad (I think so) without helmet. A typical view on the Indian streets. Childcare on the roads in India has a long way to go. My "Incredible India day 2" blog should be online by tomorrow. For our first 2 nights we stayed at the Le Roi hotel in the Pagar Ganj area. A very poor area in Old Delhi, close to the main railway station known by backpackers and people looking for the "real Incredible India". And incredible it was! 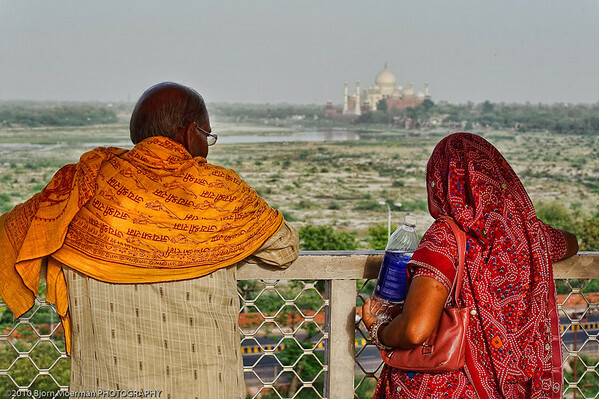 India really is a paradise if it comes to Travel photography. Across the hotel we bumped into 2 neighborhood friends sitting on a old scooter. A great start for a great photo adventure! 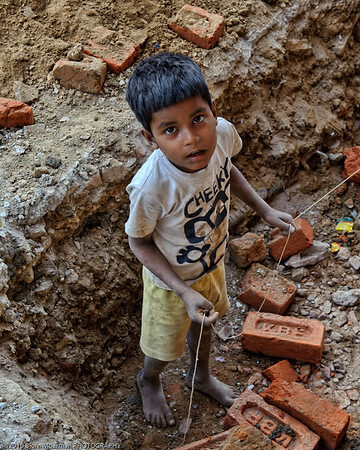 Just a few meters further a young boy was helping his parents building a wall. While I was playing with Lego bricks at that age, he's doing the real stuff. 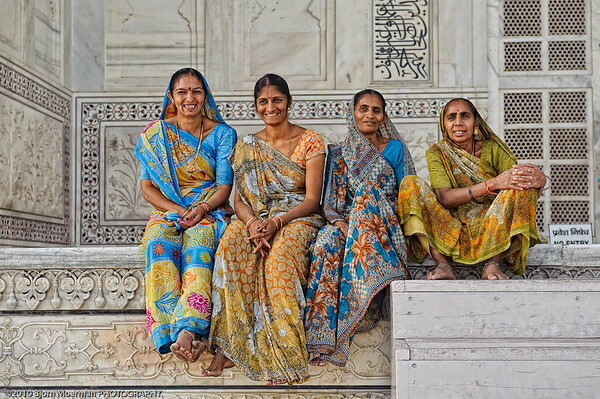 Looking at the first 3 images, it's obvious that photography in India is all about its people. I always find it intriguing that people who barely have anything in life are still so optimistic and almost never loose their smiles. 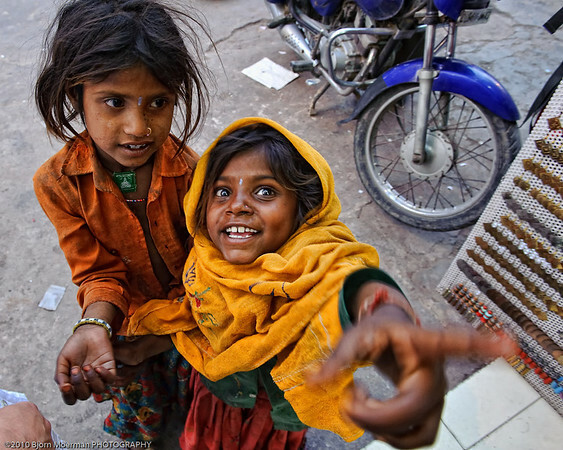 Next time you feel the whole world is against you, think about these 3 photographs! Walking past this man, gave a real Gandhi feel... I just couldn't resist! 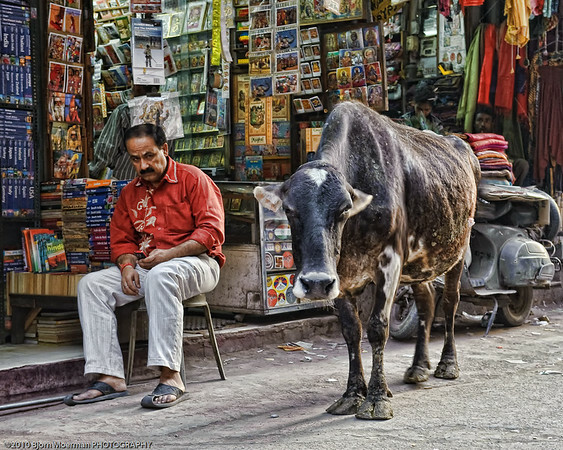 A man selling second hand books was obviously not very pleased with the Holly Cow standing in front of his shop. I really like the expression on his face. The last image was shot from the roof top restaurant where we had dinner on day 1. 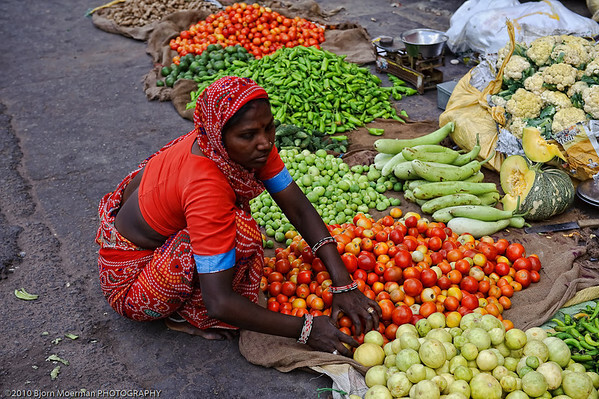 It is so typical for Indian street life. 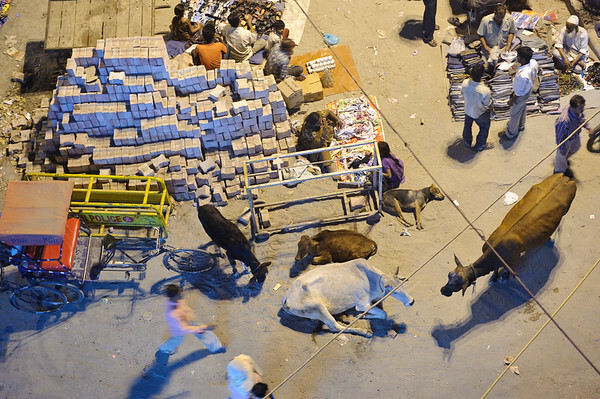 Cows, a dog, a bicycle Rickshaw and people selling textiles. Welcome to Incredible India! 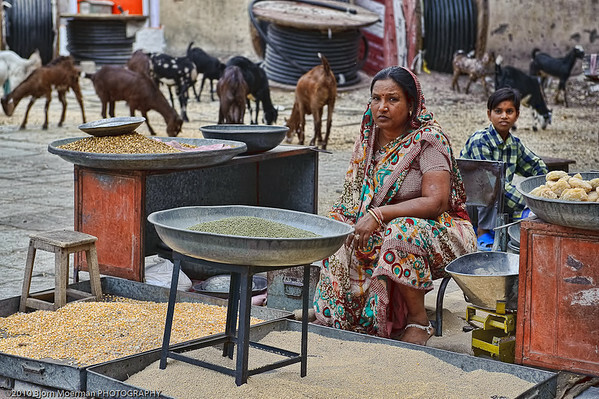 Images will be added to my Incredible India galleries as they are processed... Editing +1500 images will keep me busy for a while.